Man, it’s hot. I know we New Englanders pride ourselves on withstanding all manner of brutal weather, but these 5-day arcs of 90-degree days packed with humidity are unpleasant. 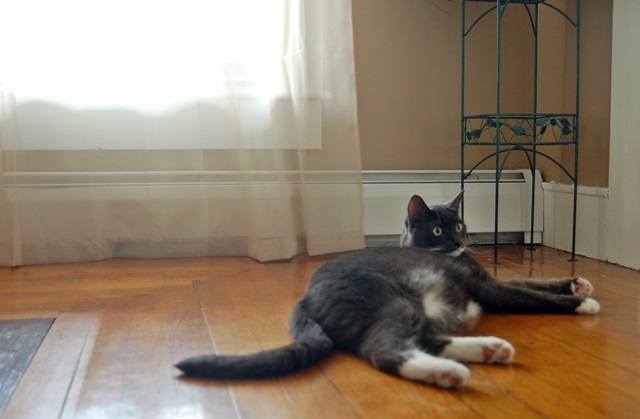 We do have a window air conditioner…but it’s still sitting on the bedroom floor from when we moved in a month ago. It seems like when we get home from work we just want to put on the ceiling fans and collapse onto the couch with a cold drink until the heat and talking heads on CNN make us too drowsy to do anything but head to bed. Even Bones is too hot to chew on the corners of all my books. I guess I’m trying to prove to myself I can endure the heat to save the pennies from running the AC. After all, frugality is a Yankee virtue. 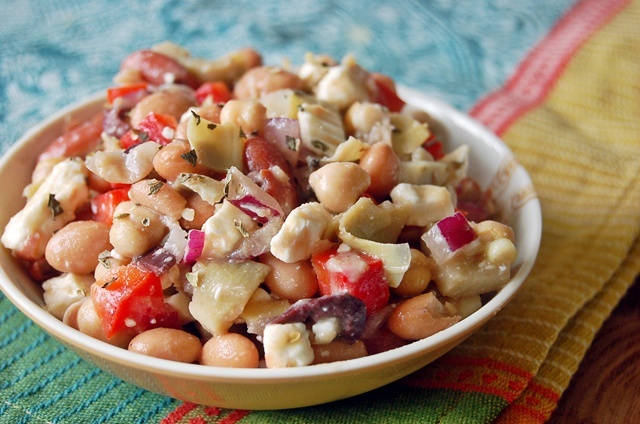 It’s all led to an awful lot of quick, no-cook suppers and sides…which brings me to this recipe for three bean salad with artichoke hearts, olives, and feta! Three bean salad has the potential to be an ideal meatless side dish, but unfortunately, I’ve encountered far too many versions made with one of my staunchest foes — the green bean. 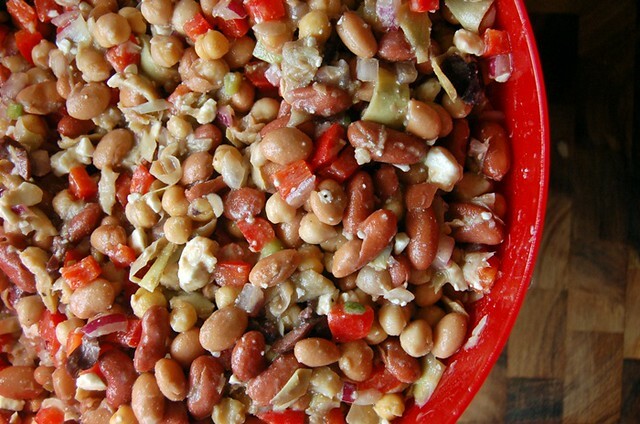 Unless they’re cooked to death in a soup or prepared Greek-style in a tomato sauce (which is divine) I’m not a big fan, so I’ve adapted the traditional three bean salad to use kidney, pinto, and garbanzo beans instead. The result is a terrific salad that makes a great side dish or sandwich wrap filling. The beautiful thing about these salads is how flexible they are. Don’t like red peppers? Swap them out for cucumbers or cherry tomatoes. Want more flavor? Add some fresh herbs, lemon juice, or roast the red pepper. Toast some pita chip croutons! When I’ve eaten a few bowls as side dishes I like to us it as the base for a tasty wrap sandwich packed in with spinach, baby romaine, and sometimes a little hummus. Both are great summer dishes when it’s too hot to cook…and speaking of summer…this is also great to bring to a picnic or barbecue. If you’re willing to share. Drain and rise the beans before combining them in a large bowl. Add the artichoke hearts, pepper, onion, scallions, olives, and feta. Toss to combine, then season with salt and pepper to taste. Pour the dressing (recipe below) over the mixture and toss a few more times to combine. Season to taste with additional spices like basil, thyme, parsley, or oregano. Cover and refrigerate for several hours or overnight. Serve chilled. Combine all ingredients in a large bowl and whisk together until smooth.